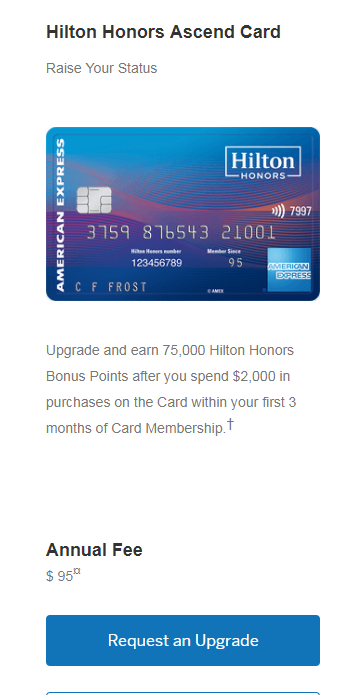 I logged into my American Express account to view the offers available to me, and I noticed a banner in the middle enticing me to ‘upgrade’ to the Hilton Honors Ascend card, and get 7,500 bonus points after spending $2,000 in 3 months. 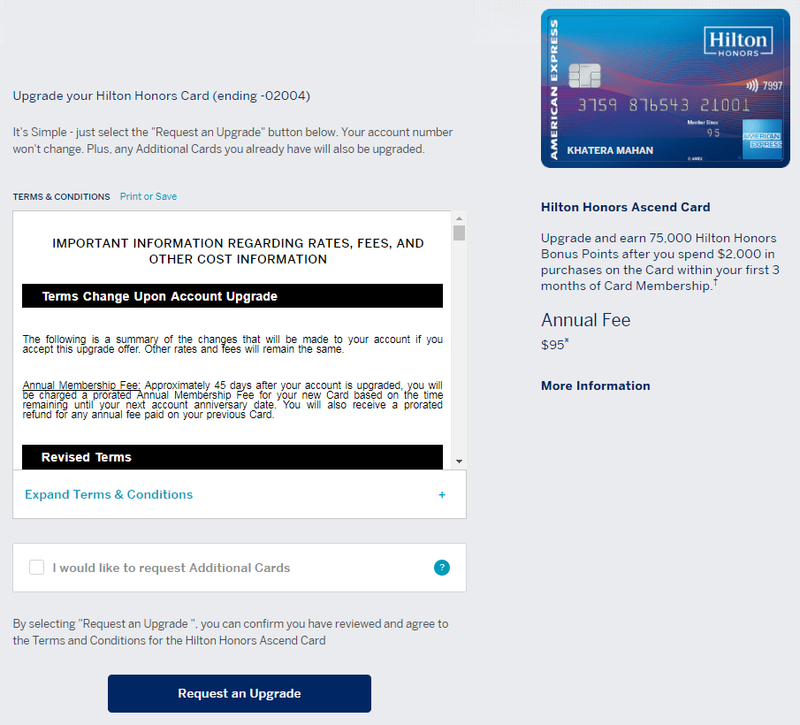 The thing that intrigued me was I just product changed (downgraded) my old Hilton Surpass card to the no-fee card, since the annual fee was up, and they sent me the new no -fee card just like two weeks ago. They even issued the replacement card with the same number, which was cool. I actually wanted to see if this would work, so I went ahead and accepted the offer. It prompted me for the 4 digit security number, and that was it! No need to fill out an application. I combed through the terms and conditions and I did not see anything about not getting the bonus if I had the card before, or any other lifetime language associated with Amex cards usually. Of course, this is just an upgrade, supposedly. Some people are reporting they are not seeing the offer anymore in their account when they log in. However, there is a nice link that will show you all the offers available to you, and I got it from a rep using secure chat. Just log into your account from one browser window, then open another window, and copy and paste this link below into the address bar. It will then show you all the off. Once you click on Request an Upgrade, it will then just ask you again, and that’s it. You can also view other offers that you qualify for. I was also targeted for a 50,000 bonus point Premier Rewards Gold card, which I would love to get, but probably wont right now. I’m at 6/24 so I’l wait that one out for a bit, as the offer comes and goes. Are you seeing the offer when you click on the link? Let me know.